We are very proud of the range of architectural and interior design imagery generated recently. It would be our pleasure to share some of it with you. Please feel free to comment or contact us for any 3d imagery requirements you may have. Enjoy this short graphical eye candy article. The above 3d render was for a development in Wheelers Hill. A wonderful couch by Patricia Urquiola sets the theme for this image. The ever popular ‘cut-through’, a great way to convey the space in one image. A morning scene – coffee and a croissant – developed for the same development in Wheelers Hill, this image shows a different apartment configuration from the one depicted above. We felt it deserved it’s own view point to give the viewer a different perspective for a different apartment. Lila – Mordialloc development. One of our favorite exterior images this year. The cherry blossoms, the ivy, the sun is going down over Mordialloc. Exterior showing the Mordialloc development from a different street and time of day. Below are the interior imagery for this project. Next up we have some interiors for a ‘beachy’ apartment development in Sandringham. 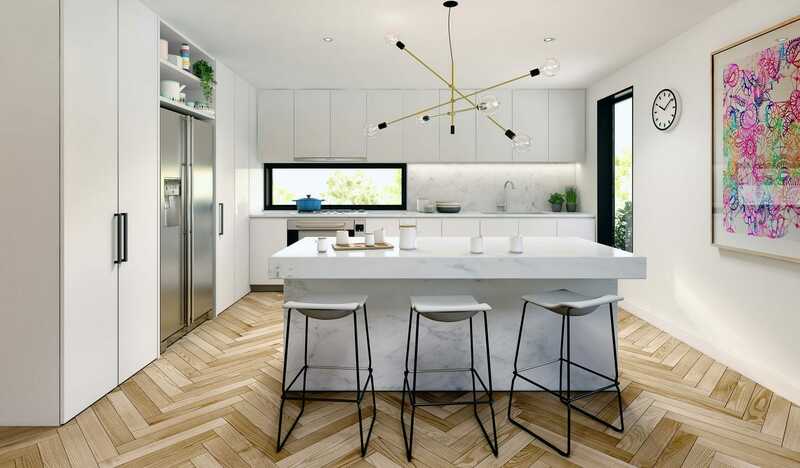 We love the bright and airy feel to these images as well as the herring bone floors in the living and kitchen areas. We’ll finish up for now with a work in progress – 3d exterior, Toorak Road. Please feel free to get in touch with us with any comments or enquirers . . .